We offer comprehensive drone and data services for Environmental Sites, Oil and Gas Operations, Real Estate and Construction (AEC). Overseen by our credentialed pilots and trained to process and analyze advanced data, we have the experience to assist you in project specific support. 30% of the cost of construction is wasted in the field due to coordination errors, wasted material, labor inefficiencies and other problems that arise during the traditional course of construction.1 Drones offer streamlined data, faster. We don’t just collect data for you – we offer acumen. 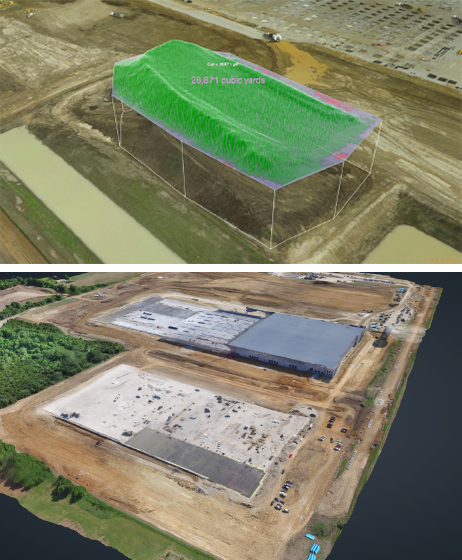 Overseen by our experts, advanced sensor data is interpreted for you and aerial imagery can be used to identify specific issues on your job site. Aerial intelligence can help job site planning, site selection, estimating, specific project analysis, inspections, equipment rig moves, ICS support, and safety surveillance are just a few of the applications. We are a fully integrated service company and our drone-based solutions help make your operations more safe, efficient, and cost-effective.